In first State of the Union address, Trump tells natural disaster victims: "We are with you"
In his first State of the Union address, President Donald Trump touted a "new tide of optimism" sweeping the country in the wake of his administration's "righteous mission" to address immigration reform and unemployment, among other issues. 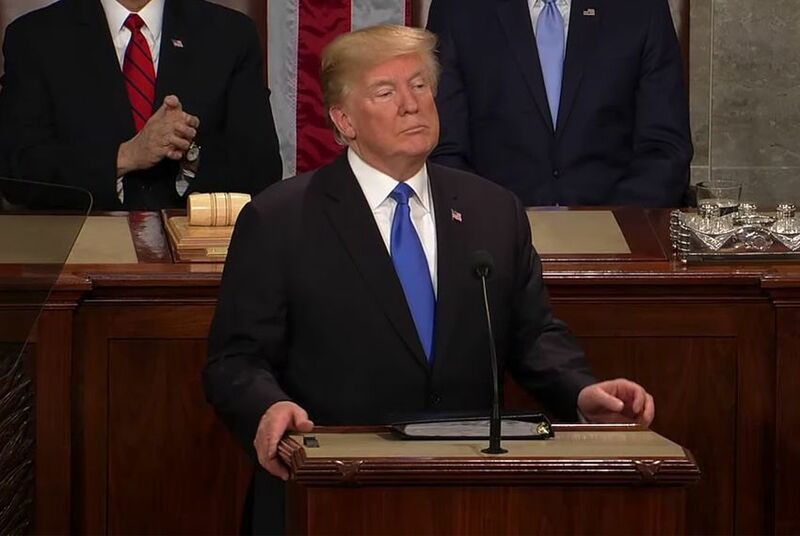 WASHINGTON — In his first State of the Union address, President Donald Trump touted a "new tide of optimism" sweeping the country in the wake of his administration's "righteous mission" to address immigration reform and unemployment, among other issues. The president wasted no time in addressing the devastating impact of natural disasters on communities around the country, including in Houston following Hurricane Harvey. "We have endured floods and fires and storms, but through it all, we have seen the beauty of America's soul and the steel in America's spine," Trump said early in the speech. He praised the work of the Cajun Navy, a volunteer network of boat owners who aided in rescue efforts in Harvey's aftermath. Trump's guest list included Jon Bridgers, who founded the group in 2016. "To everyone still recovering in Texas, Florida, Louisiana, Puerto Rico and the Virgin Islands, everywhere, we are with you," Trump said. "We love you, and we always will pull through together. Always." Without mentioning the North American Free Trade Agreement by name, Trump vowed to renegotiate "bad" trade deals he said hurt American companies and workers. "From now on, we expect trading relationships to be fair, and very importantly, reciprocal," Trump said. "We will work to fix bad trade deals, and negotiate new ones. And they'll be good ones, but they'll be fair." On immigration, the president pressed Congress to consider the proposal the White House released last week that includes legislation that would give legal status to roughly 1.8 million young undocumented immigrants, commonly referred to as "Dreamers." It would include a 10- to 12-year path to citizenship “with requirements for work, education and good moral character,” according to the proposal. It also includes provisions for a $25 billion trust fund to bolster border security, including money to build a wall on the southern border, and an end to "chain migration." In his speech Tuesday, Trump said a bipartisan solution was the only way to pass significant reform for the first time in more than 30 years. “This Congress can be the one that finally makes it happen,” he said. But several lawmakers could be heard jeering when the president mentioned the end to chain migration and the visa lottery system, which he said were nonsensical policies that were threats to national security. That means the road ahead is a rocky one as some Democrats have already said they’d reject the plan outright if it reached the House floor in its current form. U.S Senate Majority Whip John Cornyn spoke after the speech on whether the president's position on chain migration should be a pillar of any immigration deal. "He's the president," he said. "You're not going to pass a bill or get it signed into law without his signature, so you can't ignore it." Cornyn's fellow Texan in the Senate, Ted Cruz, criticized Democrats' behavior before the address. "I've never been to a State of the Union where one of the parties refused to applaud the president entering the chamber," Cruz said. "Every one I've been to, I stood and applauded President Obama, as did every other Republican. Even if we disagreed with him on policy, we had a respect for the institution of the presidency and the American people who elected the president." Republicans from Texas heaped praise on the party's accomplishments, notably on their successful effort to cut taxes late last year. "Tonight, President Trump articulated how our nation is growing stronger and more secure with unlimited potential for greater opportunity for hardworking Americans," said U.S. Rep. Bill Flores of Bryan. Democrats were not pleased with Trump. "Trump’s unceasing, unhinged attacks have left the state of the union endangered, chaotic, and divisive," said U.S. Rep. Lloyd Doggett, D-Austin. "What a wide gap between his tweets and his teleprompter." U.S. Rep. Joaquin Castro, D-San Antonio, wore a black suit and a black tie in a nod to the ongoing movement against sexual harassment. He called the speech "subdued" but said he was frustrated that the president "continued to tie immigrants to criminality." He also criticized Trump for neglecting to mention anti-sexual harassment sentiment and Russian interference in the 2016 election. Castro is an investigator in that matter as a member of the U.S. House Intelligence Committee. U.S. Rep. Marc Veasey, a Fort Worth Democrat, also wore a black jacket — but, like many of his African-American colleagues, he also wore a piece of kente cloth over his shoulder as a protest against recent alleged remarks the president made referring to African counties as "shitholes." "Oh, I didn't like it at all. I thought it was very divisive," he said of the speech. "I ... thought that, as someone whose family and ancestors descended from the continent of Africa, that he would have made some sort of apology or amends — if he could have even mentioned the fact that it was slaves that built the U.S. Capitol in his closing, but he didn't do that," Veasey said.